What’s the scariest star in all the heavens? Around Halloween, look for Algol – a star named for a demon! 2018 EarthSky lunar calendars are here! Get yours now. 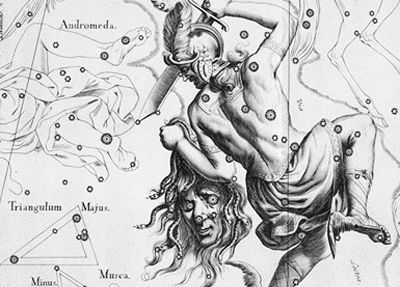 If you were one of the early stargazers, you might have chosen Algol in the constellation Perseus. Early astronomers nicknamed Algol the Demon Star. Bwahaha! Of course, like all stars, Algol isn’t the least bit scary. But it’s associated in skylore with a mythical scary monster – the Gorgon Medusa – who had snakes instead of hair. It’s said that she was so horrifying in appearance that the sight of her would turn an onlooker to stone. 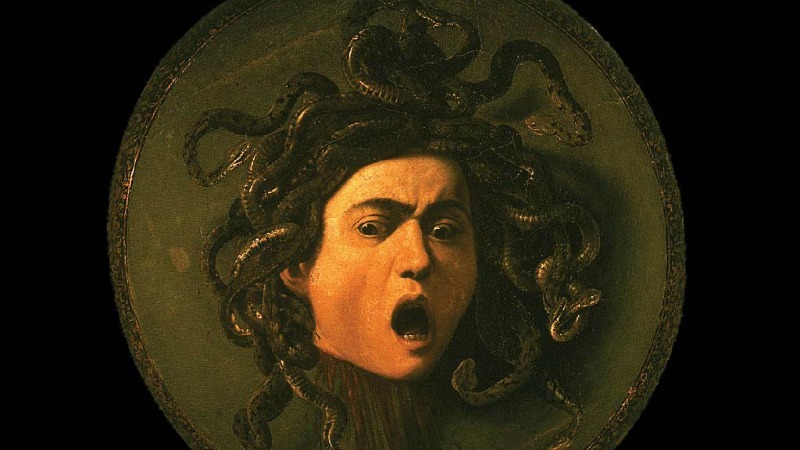 The star Algol takes its name from an Arabic word meaning “the Demon’s Head.” This star is said to depict the terrifying snake-y head of the Medusa monster. In the mythology of the skies, Perseus – a great hero often depicted mounted on Pegasus the Flying Horse – used Medusa’s head to his own advantage – to turn Cetus the Sea-monster into stone. Perhaps the ancients associated this star’s variable brightness with the evil, winking eye of the Medusa. Winking? Yes. Algol is a known variable star, which waxes and wanes in brightness. There are many variable stars known throughout the heavens, but Algol might well be the most famous variable star of them all. This star brightens and dims with clockwork regularity, completing one cycle in 2 days 20 hours and 49 minutes. Plus its entire cycle is visible to the eye alone. The early stargazers surely knew about its changing brightness and must have smiled as they named variable Algol – a strangely behaving star in a sky full of steadily shining stars – for a mythological demon. How can you see Algol? It’s easy to find. Our sky chart shows the northeastern sky for autumn evenings, especially around Halloween. The conspicuous W or M-shaped constellation Cassiopeia enables you to star-hop to Perseus. 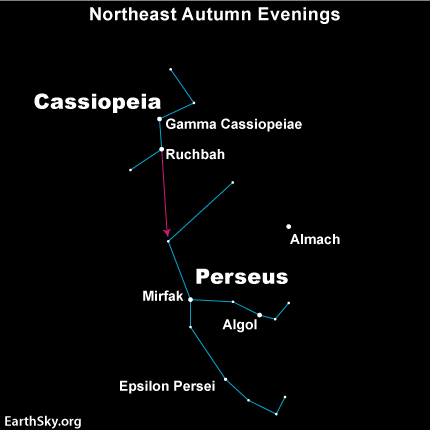 Draw an imaginary line from the star Gamma Cassiopeia through the star Ruchbah to locate Perseus and then Algol. At mid-northern latitudes, this star can be seen for at least part of the night all year round. But it’s best seen in the evening sky from autumn to spring. It’s visible in the northeast sky in autumn, shines high overhead in winter, and swings to the northwest sky by spring. Algol brightens and dims with clockwork regularity, completing one cycle in 2 days, 20 hours, and 49 minutes. Moreover, this variable star is easy to observe with just the unaided eye. At its brightest, Algol shines about three times more brightly than at its faintest. At maximum brilliance, Algol matches the brightness of the nearby second-magnitude star Almach. At minimum, Algol’s light output fades to that of the star Epsilon Persei. Modern-day astronomy has unlocked the secret of Algol’s mood swings. It’s an eclipsing binary star. This kind of binary is composed of two stars, with each star revolving around the other. From Earth, we see the orbital plane of this binary star almost exactly edge-on. Therefore, when the dimmer of the two stars swings in front of the brighter star, we see Algol at minimum brightness.